The incidence and mortality rates for oral cancer are increasing and it represents an important global health problem. Many oral cancers are preceded by potentially malignant disorders (PMD) e.g erythroplakia, non-homogeneous leukoplakia, erosive lichen planus and oral submucous fibrosis. Early detection of PMD can reduce malignant transformation rate and improve survival from oral cancer. The aim of this review was to estimate the diagnostic accuracy of tests for the detection of oral cancer and PMD of the lip and oral cavity, in people presenting with clinically evident lesions. Searches were conducted in the Cochrane Oral Health Group’s Trials Register, Cochrane Register of Diagnostic Test Accuracy Studies, Medline, Embase, and MEDION. Searches were not limited by language or publication status. Cross-sectional diagnostic test accuracy studies (or consecutive series) and randomised studies of diagnostic test accuracy that reported the diagnostic test accuracy of the following index tests when used as an adjunct to conventional oral examination in detecting PMD or oral squamous cell carcinoma of the lip or oral cavity: vital staining, oral cytology, light-based detection and oral spectroscopy, blood or saliva analysis (which test for the presence of biomarkers in blood or saliva) were considered. 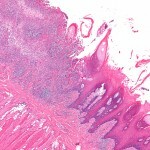 Scalpel, punch or fine needle aspiration biopsy with histological diagnosis was the reference test. Two reviewers independently selected studies, extracted data and assessed methodological quality using a modified QUADAS-2 approach. Meta-analysis was used to combine the results of studies for each index test using the bivariate approach to estimate the expected values of sensitivity and specificity. 41 studies, recruiting 4002 patients were included. No single study could be classified as being at low risk of bias across all domains. Six studies assessed two combined index tests. There were no eligible diagnostic accuracy studies evaluating blood or salivary sample analysis. The utility of vital staining should be confined for use by expert clinicians to facilitate biopsy site selection in heterogeneous PMDs, or as a surveillance tool. Macey R, Walsh T, Brocklehurst P, Kerr AR, Liu JLY, Lingen MW, Ogden GR, Warnakulasuriya S, Scully C. Diagnostic tests for oral cancer and potentially malignant disorders in patients presenting with clinically evident lesions. Cochrane Database of Systematic Reviews 2015, Issue 5. Art. No. : CD010276. DOI: 10.1002/14651858.CD010276.pub2. I’m experienced with blade and brush biopsy. I prefer blade, and have no problem with acceptance. Blade biopsy is pretty easy and the standard. Why do anything else?